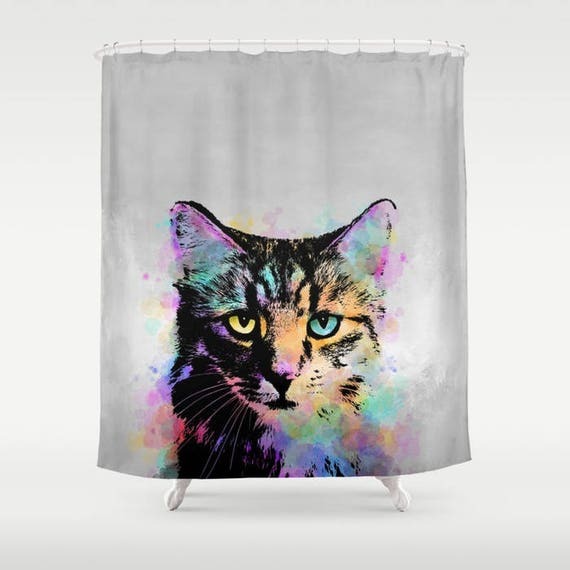 A cat face on a shower curtain. From Amazon. 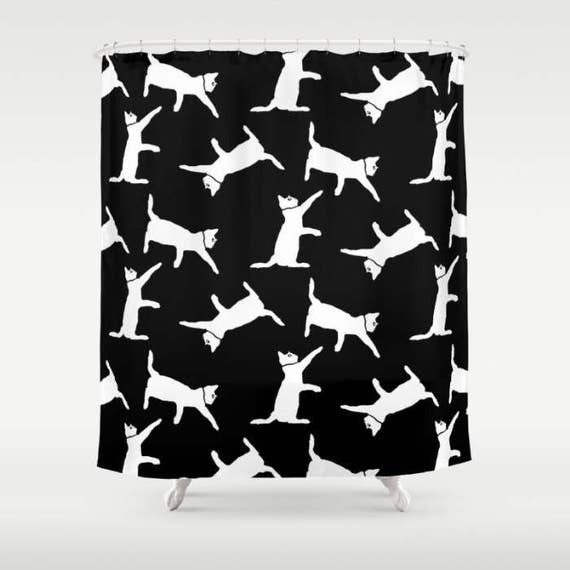 A shower curtain, just like the name implies, is an accessory used in showers and/or bathtub shower combos. Their original two purposes were to keep water from escaping the shower area and spraying into the room, and to provide some privacy for the person taking the shower. 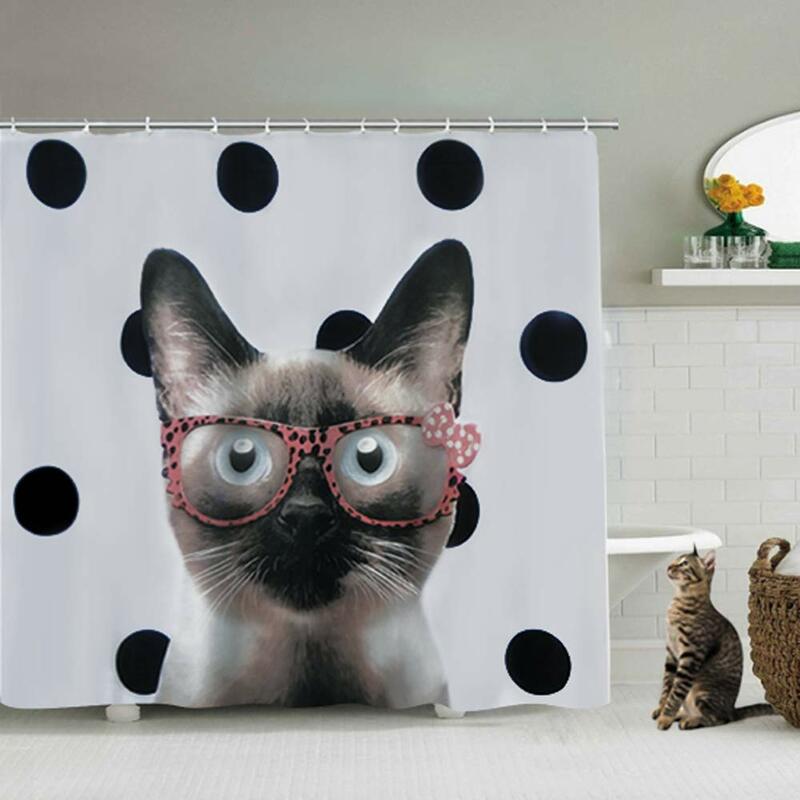 While they’re still used for these purposes, in many homes they now have a third job: To be attractive, cute, and/or decorative, lending a pleasing look to the bathroom where they’re located. 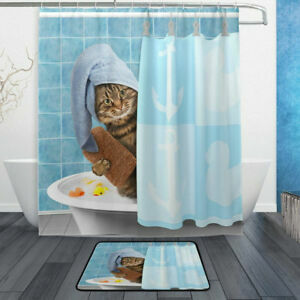 There is usually an excellent selection of cat shower curtains from Amazon, eBay, and Etsy. This page lets you compare prices and selections from all three of these major suppliers on one page! 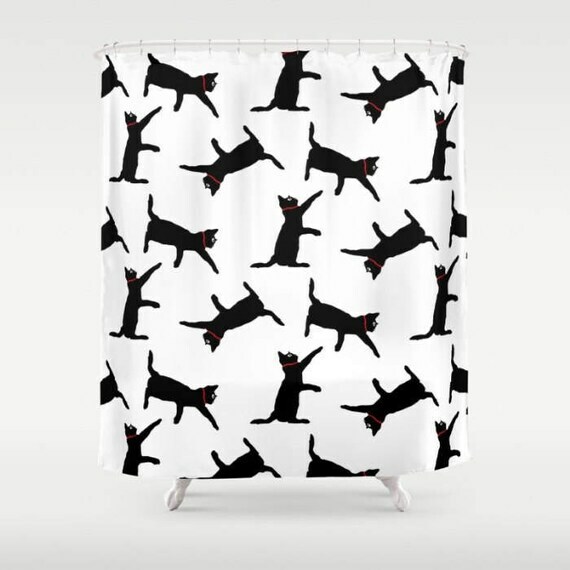 Shopping for a cat on a shower curtain? Here are a few good things to consider before you buy. 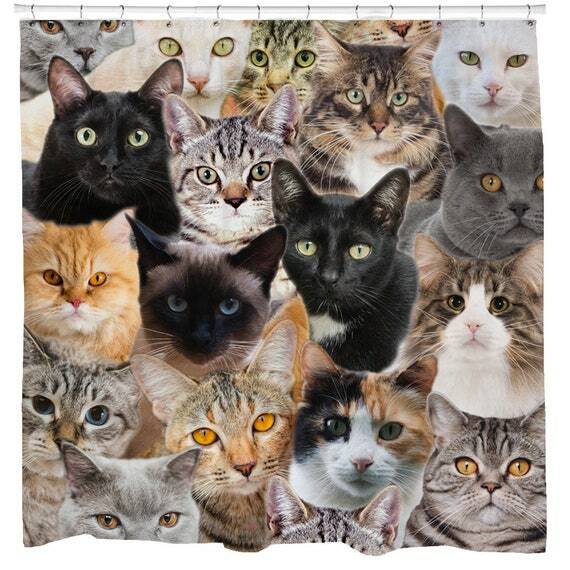 What size (height and width) is the shower curtain? If your shower is inside a bathtub, it might be handy to know that a standard sized bathtub is 60 inches (5 feet) long. 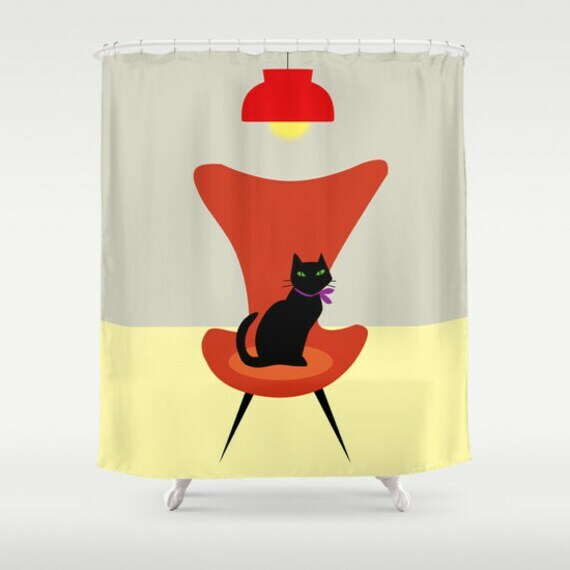 To accommodate this size of tub/shower, many shower curtains are 70 inches wide X 70 inches tall; 71 inches wide X 71 inches tall; or 72 inches wide X 72 inches tall. 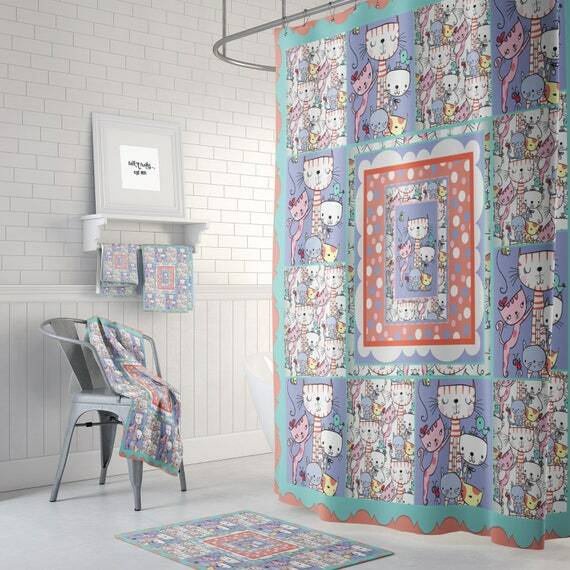 If your tub/shower is a different size, you might need a larger or smaller shower curtain. 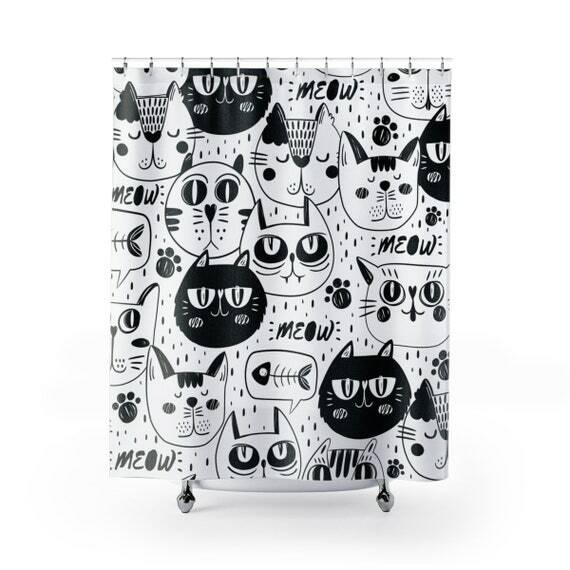 Does the shower curtain have matching accessories such as shower hooks, a mat or rug for in front of the shower, a coordinating rug or cover for the toilet, etc.? If so, are these items included or do you purchase them separately? 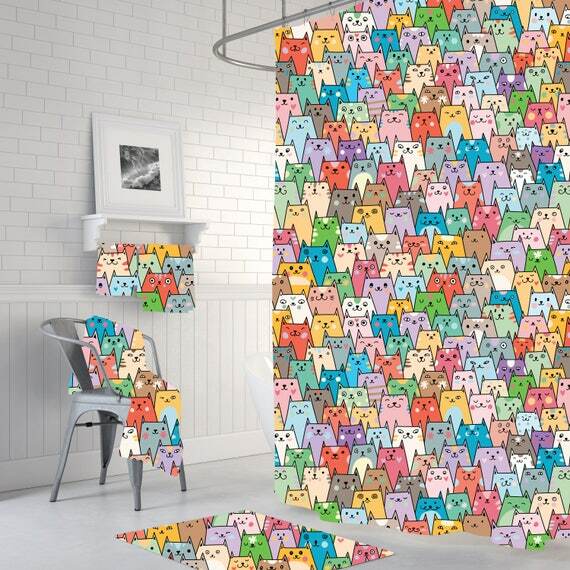 Shower curtains can and do get dirty. 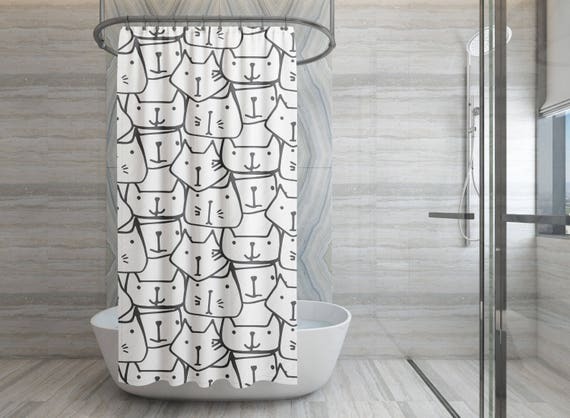 Is a shower curtain you’re interested in machine washable? 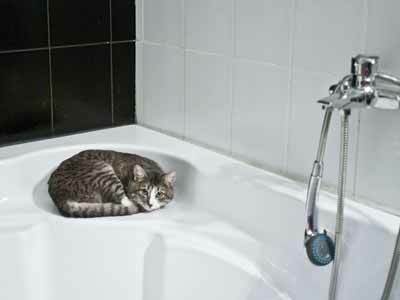 A cat relaxing in a bathtub with a shower. 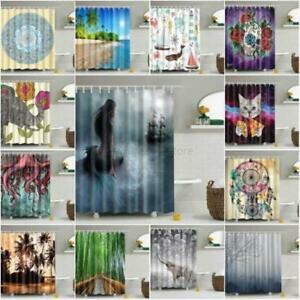 Is the shower curtain made from natural materials or synthetic? 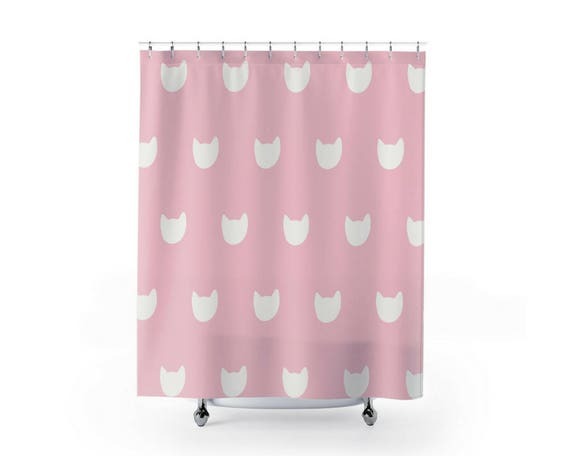 Shower curtains made from natural materials (cotton, linen, silk, and others) typically cost more than synthetic curtains but they offer a luxurious look and feel. Compared to synthetic curtains they are often slower to dry and are more prone to the buildup of soap scum and mildew. They are also more prone to discoloration. To avoid these problems, even if they come with a built-in liner (some do, some don’t) or the manufacturer describes them as “sealed” or something similar, the manufacturer may also still recommend they be used with a liner. 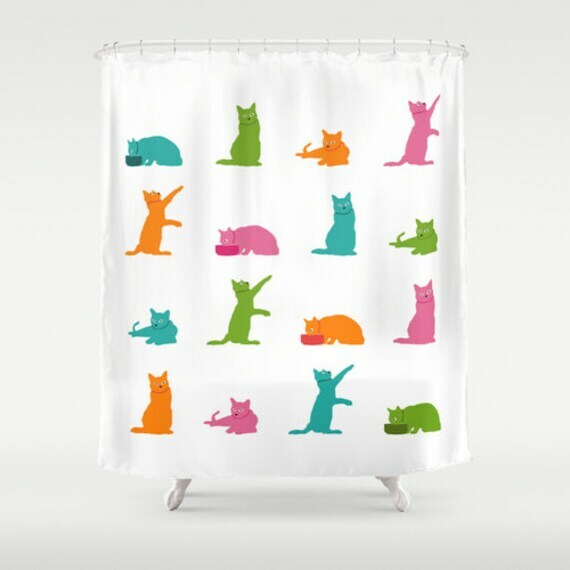 Synthetic materials used in shower curtains include vinyl, plastic, nylon, polyester, and more. These curtains typically repel water well which helps them dry quickly and also makes it harder for mildew to form on them. They are also usually reasonably priced and easy to care for. The manufacturer may or may not recommend they be used with a liner. 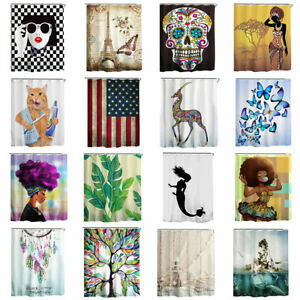 Speaking of shower curtain liners……does a shower curtain you’re interested in require a liner? If so, does it come with one or do you have to purchase it separately? 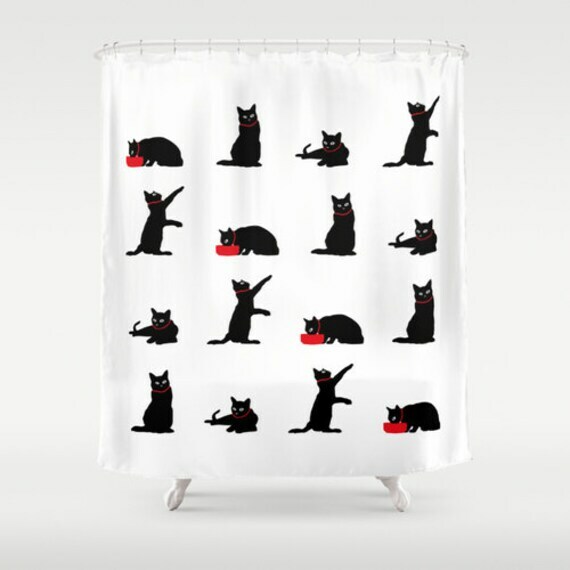 Does the cat shower curtain come with hooks for attaching it to the curtain rod? Hint: It’s common to have to purchase them separately. 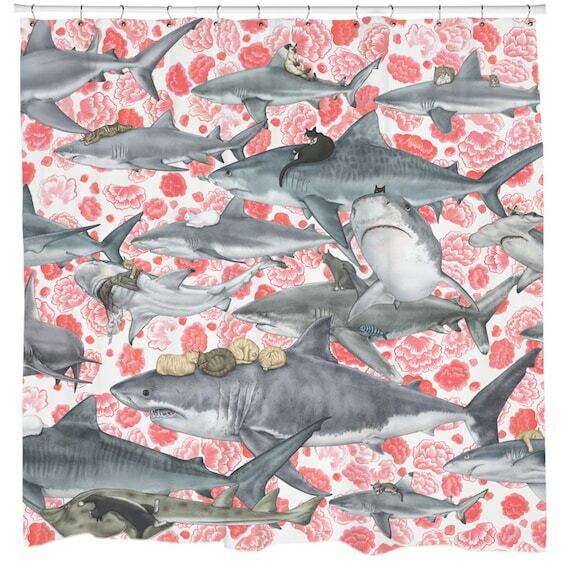 Where is the shower curtain selling and shipping from? 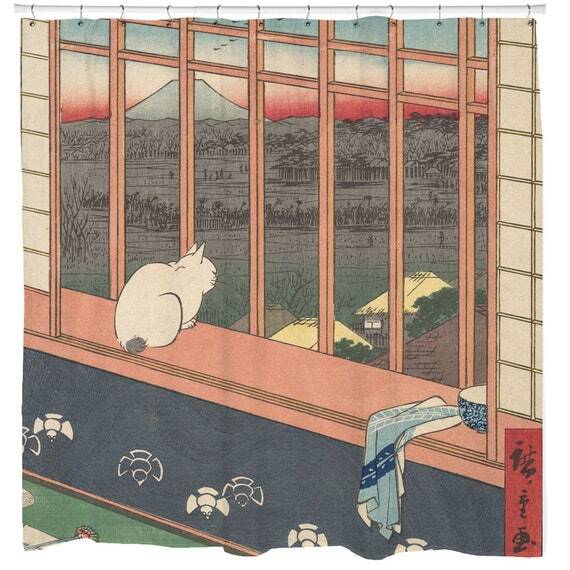 Most of the ones we’ve seen are in the USA but some sellers might be located in another country, like China. 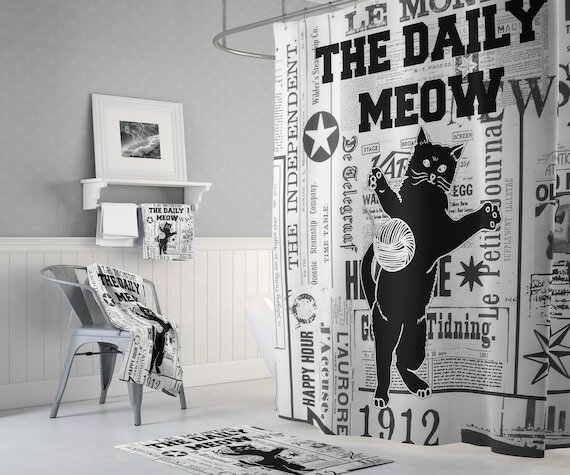 That might be fine with you but it can often greatly increase the time it will take for the shower curtain to arrive after it’s shipped. Does the seller accept returns? 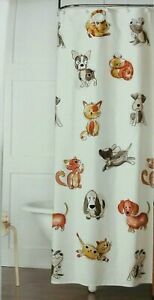 If you choose to return the shower curtain how long do you have to send it back? Who pays for the return shipping, you or the seller? Hint: It’s probably you. 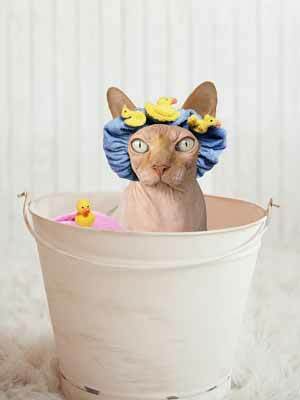 A hairless cat in a shower cap. Why? Because it’s adorable. A bit weird, of course, but adorable. It’s a question almost as old as the first shower curtain itself: Where does the liner go? 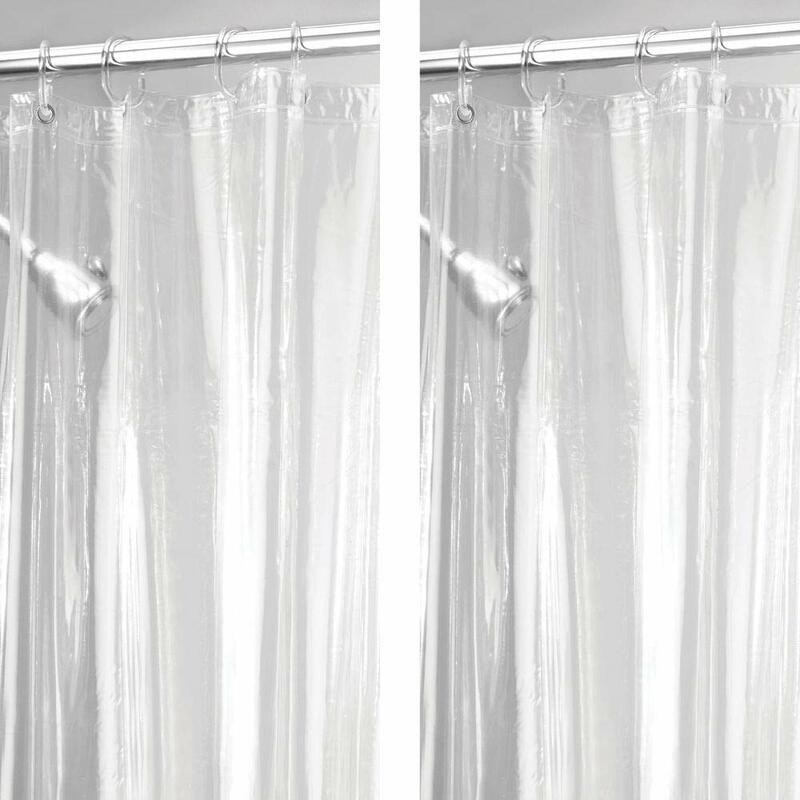 To use a liner with a shower curtain, the liner goes on the inside the tub, and the shower curtain falls on the outside.